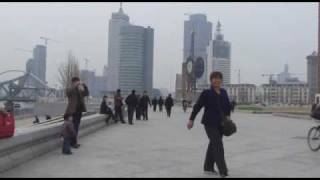 N 39° 8' 31" and E 117° 10' 35"
Tianjin in Tianjin Municipality with it's 11,090,314 habitants is a city located in China about 67 mi (or 108 km) south-east of Beijing, the country's capital town. Current time in Tianjin is now 11:38 PM (Saturday). The local timezone is named Asia / Shanghai with an UTC offset of 8 hours. We know of 7 airports closer to Tianjin, of which 4 are larger airports. The closest airport in China is Tianjin Binhai International Airport in a distance of 9 mi (or 15 km), East. Besides the airports, there are other travel options available (check left side). There are several Unesco world heritage sites nearby. The closest heritage site in China is Temple of Heaven: an Imperial Sacrificial Altar in Beijing in a distance of 62 mi (or 100 km), North-West. In need of a room? We compiled a list of available hotels close to the map centre further down the page. Since you are here already, you might want to pay a visit to some of the following locations: Gulou, Dahutong, Santiaoshi, Nanshi and Guangkai. To further explore this place, just scroll down and browse the available info. Let's start with some photos from the area. hauled by DF4D-0001 diesel engine; Chinese long-distance night train from Qiqihar (Heilongjiang province) to Xian (Shaanxi province) via Harbin, Changchun, Shenyang, Tianjin, and Taiyuan. Nearby the Ligonglou Bridge (李公楼桥), connecting Hedong (河东区) and the business district of Heping (和平区). 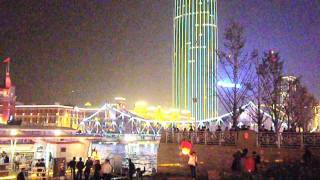 灯篭飛ばし 天津駅前 海河 2011年10月5日 Flying Lanterns Tianjin Station Square & Hai River October 5, 2011. 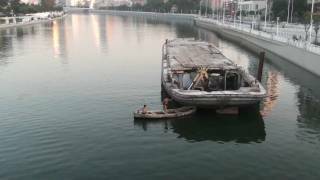 Il fait chaud, un beau soleil, rien de tel qu'un bon petit bain dans la rivière, non polluée bien sur, de Tianjin. 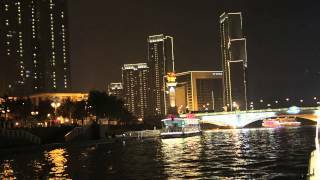 Tianjin is a metropolis in northern China and one of the five national central cities of the People's Republic of China (PRC). 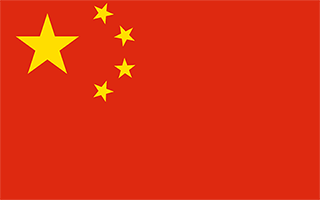 It is governed as one of the four direct-controlled municipalities of the PRC, and is thus under direct administration of the central government. Tianjin borders Hebei Province and Beijing Municipality, bounded to the east by the Bohai Gulf portion of the Yellow Sea. Part of the Bohai Economic Rim, it is the largest coastal city in northern China. Located at 39.1333, 117.183 (Lat. / Lng. ), about 1 miles away. Nankai University, commonly known as Nankai, is a public research university based in Tianjin on mainland China. Founded in 1919 by educators Zhang Boling (1876-1951) and Yan Fansun (1860-1920), Nankai University is a member of the Nankai serial schools. It is the alma mater of former Chinese Premier and key historical figure Zhou Enlai. Nankai University is regarded as one of the top and first class universities in China. Located at 39.1011, 117.165 (Lat. / Lng. ), about 3 miles away. Yaohua High School is a key school directly under the Tianjin Municipal Committee of Education, in the People's Republic of China. Located at 39.1175, 117.194 (Lat. / Lng. ), about 2 miles away. 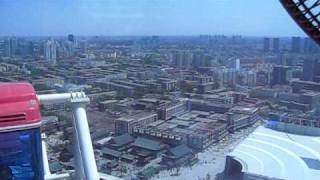 The Tianjin Radio and Television Tower is a 415.2 m (1,362 ft) tower in Tianjin, China used primarily for communication. It was built in 1991 at a cost of $45 million. Approximately two-thirds up the tower is an observation pod with floor space 253m (830 feet) (used mostly for communication equipment). It is a member (10th tallest) of the World Federation of Great Towers. Located at 39.0919, 117.175 (Lat. / Lng. ), about 3 miles away. Tianjin University is a national university under the direct administration of the Ministry of Education of China. It is the first modern higher education institution in China. It was established in 1895 as Tientsin University/Imperial Tientsin University and later Peiyang University (Beiyang University). In 1951, after restructuring, it was renamed Tianjin University, and became one of the largest multidisciplinary engineering universities in China. Located at 39.1082, 117.179 (Lat. / Lng. ), about 2 miles away. Heping District is a district in the center of Tianjin, People's Republic of China. The district has a long history. It comprises an area of 9.97 km . There are 6 subdistricts divided into 88 residential committees (社区居委会). Heping District is traditionally the cultural, commercial and financial center of Tianjin City. CBDs, shopping centers, shopping malls & banks are concentrated in this District. The leader of the district is Li Runlan (李润兰). Yaohua High School is located in the district. Located at 39.1169, 117.197 (Lat. / Lng. ), about 2 miles away. Tianjin Nankai High School is an elite college-preparatory high school in Tianjin, China. This is the original Nankai High School, and it is often referred to as Nankai High School in Tianjin to differentiate it from Chongqing Nankai Middle School, its sister school in Chongqing. Nankai is notable as one of the first modern secondary schools in China, and boasts several of the most notable men in modern Chinese history as its alumni. Located at 39.1306, 117.165 (Lat. / Lng. ), about 1 miles away. Hongqiao District is a district in the city of Tianjin, China. The name of the district derives from the name of a bridge - Dahong Bridge (大红桥, lit. big red bridge) - on the Ziya River, a tributary of Hai River. Located at 39.1697, 117.152 (Lat. / Lng. ), about 2 miles away. Tianjin International Trade Centre is a skyscraper with 80 floors and a floor area of 260,000 m², which is since under construction at 112 Munan Road in Tianjin, China. Tianjin International Trade Centre will have, when completed, a roof height of 300 m . Construction of Tianjin International Trade Centre commenced in 1998 and then was pending for 3 years. Its construction has recommenced and its completion is now expected for 2013. Located at 39.1139, 117.216 (Lat. / Lng. ), about 3 miles away. Tianjin Locomotive Stadium is a multi-use stadium in Tianjin, China. It is currently used mostly for football matches. This stadium's capacity is 12,000 people. Located at 39.1693, 117.204 (Lat. / Lng. ), about 2 miles away. Tianjin Eye is a 120-metre tall giant Ferris wheel built above the Yongle Bridge (formerly Chihai Bridge), over the Hai River in Tianjin, China. It is claimed to be the only such wheel to have been constructed over a bridge. Construction started in 2007, with completion of the main body on 18 December 2007, and the wheel opened to the public on 7 April 2008. At the time of its completion, only the 135 m London Eye, 160 m Star of Nanchang, and 165 m Singapore Flyer were taller. Located at 39.1534, 117.18 (Lat. / Lng. ), about 1 miles away. 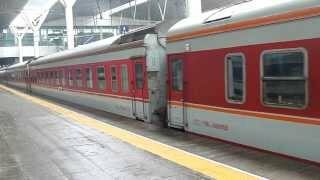 The Tianjin Railway Station is the principal railway station in Tianjin, China. It was built in 1888, was rebuilt in 1987-1988, and restructured in 2007-2008. Since August 1, 2008, it serves as the terminus for high-speed trains to the city, including the Beijing–Tianjin Intercity Railway, which can reach speeds above 350 km/h. Located at 39.1347, 117.203 (Lat. / Lng. ), about 2 miles away. Minyuan Stadium Tianjin, China. It is currently used mostly for football matches and hosted the home matches of Tianjin Teda F.C. until the TEDA Football Stadium opened in 2004. The stadium holds 18,000 spectators. Eric Liddell helped build the stadium when he was a missionary in Tianjin, modelling it on Stamford Bridge of London, which was Liddell's favourite athletics venue. Located at 39.1111, 117.199 (Lat. / Lng. ), about 2 miles away. The Tianjin West Railway Station is a high-speed railway station in Tianjin, People's Republic of China. 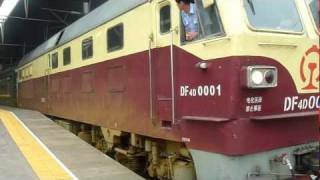 It's served by Jinghu Railway and Jinbao Railway and by the Jinghu High-Speed Railway. Located at 39.1572, 117.161 (Lat. / Lng. ), about 1 miles away. Tianjin St. Joseph Cathedral, also known as Xikai (西开) Catholic Church, is a Roman Catholic church located in Tianjin’s central commercial district and original French concession, at the southern end of Binjiang Dao (槟江道) in Heping (和平) District. It is one of Tianjin’s protected historical relics. The church was built in 1913 under the name of MG Church before it was renamed St. Joseph's Church. It continues to be the largest Roman Catholic Church in China's Tianjin province. Located at 39.1169, 117.188 (Lat. / Lng. ), about 2 miles away. Located at 39.1364, 117.166 (Lat. / Lng. ), about 1 miles away. Located at 39.1042, 117.217 (Lat. / Lng. ), about 3 miles away. Located at 39.1136, 117.21 (Lat. / Lng. ), about 3 miles away. Located at 39.1175, 117.191 (Lat. / Lng. ), about 2 miles away. Located at 39.1192, 117.181 (Lat. / Lng. ), about 2 miles away. Located at 39.1203, 117.173 (Lat. / Lng. ), about 2 miles away. Located at 39.1294, 117.168 (Lat. / Lng. ), about 1 miles away. Located at 39.1706, 117.156 (Lat. / Lng. ), about 2 miles away. Qinjiandao Station, literally Qinjian Road Station in English, is a station of Line 1 of the Tianjin Metro. It started operations on 12 June 2006. Located at 39.1772, 117.147 (Lat. / Lng. ), about 3 miles away. Tianjin Crafts and Arts Vocational College, commonly known as Tianjin Art and Design Academy, is a public tertiary education institute based in Tianjin on mainland China. It was founded in 1959 in the name of "Tianjin Art and Design Academy." These are some bigger and more relevant cities in the wider vivinity of Tianjin.